Taken from the idea of beef carpaccio which was apparently created at Harry's bar in Venice in the 1950s, the Tahitian twist of making it with fresh, raw tuna has become such a success that you can find this dish at nearly every restaurant in French Polynesia. Personally, it's an all time favorite of mine when poisson cru feels to rich and sashimi too plain. This is a true fusion dish that takes most of its flavors from the Mediterranean. As with my poisson cru recipe, you could experiment using different types of fish. I've never tried this dish with anything besides tuna but it could theoretically work with halibut, trevally or salmon. I find that tuna is more easily cut into paper-thin slices if it's been frozen and thawed slightly. If it's soft it gets gooey and you're slices will be thicker and not as pretty. Lay the slices on a large plate in a rose pattern as you cut them and refrigerate. Chop the onion, tomato, parsley and set aside. In a small bowl combine the olive oil, lemon juice, balsamic vinegar, garlic, ginger and salt and pepper. Remove the tuna from the refrigerator and pour the olive oil mixture evenly over the top reserving about one Tbsp in the bowl. 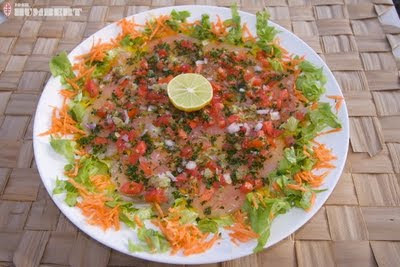 Spread the tomatoes, capers, onions and parsley over the tuna then drizzle the remaining olive oil mixture over the top. Serve with white rice. Long gone are the days when you could easily hop on any supply ship to travel around French Polynesia. Air Tahiti now flies to 48 of the 65 inhabited islands, great news if you need to get anywhere quickly but terrible news if you're on a budget. The airline has some of the most expensive domestic fares in the world, and new regulations that have forced many supply ships to stop taking passengers have made flying oftentimes the only option. 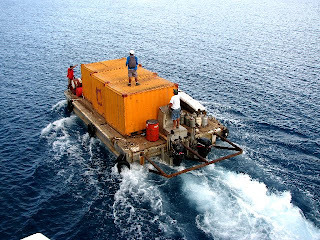 Right now in September 2009, there are only three cargo ships left that take passengers to the Tumaotus (the Mareva Nui, Kura Ora and the Marie Stella); there are no boats besides the expensive (but worth it) Aranui to the Marquesas; one boat to the Australs (the Tuhaa Pae); one to the Gambier (the Nuku Hau) and only one for the Society Island circuit (the Hawaiki Nui going from Papeete-Huahine-Raiatea-Tahaa-Bora Bora and back). Because there are less spaces available, the boats book up during school vacations but outside of these times you can usually get on no problem. To get a place on the boat you'll have to go to the company's office or talk to the boat captain directly at the docks at Fare Ute in Papeete. I have all the phone numbers for the offices and directions about how to get there in my Lonely Planet guidebook to Tahiti & French Polynesia. Bring your own bedding, snacks (some of the boats provide meals and others don't), baby wipes (especially if you won't have shower access), lots of water, sea sickness pills, something to pass the time during those long ocean stretches and of course, sense of adventure. First thing in the morning we started unloading supplies in Manihi, an atoll I know well from the days we used to fly there before Ahe got an airport. Manihi's village is right at the very short but deep pass and is one of my least favorite villages in the archipelago. The dock area is pleasant, with a big ancient tree you can sit under for shade and a little store to get a cold drink, but the rest of the village is strangely over-run with concrete and everyone has big walls or fences enclosing their yards. The closed off yards make the village feel closed off and empty too since everyone is hidden behind their fences, watching TV or doing whatever it is they do. Jasmine and I went to try and find an old dear friend, Mama Tepuku who is in her 70s and who spends about half her time in Manihi. I asked around and strangely no one knew who I was talking about. I guess it just seemed too weird for anyone to register that these two random white girls with accents would be asking for an old Paumotu lady who hardly spoke any French. Finally we found Tepuku's house and were greeted by a 20-something man who, looking at us only from the corner of his eye, yelled into the house that some white girls, "des dames blanches," were there. A pudgy local girl with a toddler came out and told us that no, Tepuku wasn't on Manihi right now but invited us in for a drink. Ends up she was Tepuku's niece and knew who I was and we had a nice chat. Afterwards we went back to the dock where we ran into a few other old friends so it was a pleasant stop. A few hours later we were docking at Ahe, our final stop where we had a near hero's welcome from all our friend's in the village as well as my husband who came with the outboard to pick us up. An arrival after flying just doesn't compare - everyone knew we had spent days getting there and it was more like meeting long lost family after months on the Oregon trail than greeting someone after clearing customs. In all, traveling by supply ship is the Polynesian equivalent of a US road trip, stopping in random towns, eating where you can and making friends along the way. You need time to travel this way but that's the beauty of it. 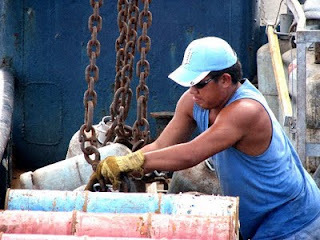 By the end of the boat voyage my body had lost every ounce of stress, all sense of time and any notion of a pressure to get somewhere. Sitting and doing nothing besides staring at the sea now seemed normal and pleasant and in a sense this made me feel much, much more Polynesian. 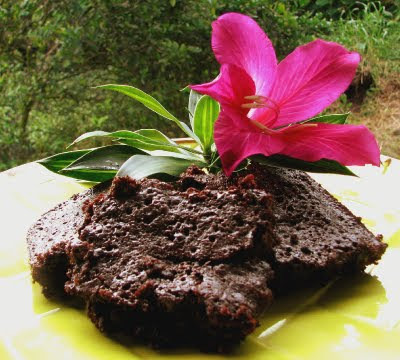 I love brownies but here in Tahiti I was never able to make them just right. The flour is somehow different, you can't get baker's chocolate or chocolate chips and nuts cost a fortune. So, I was very happy to find this, the most basic of recipes that gives the most splendid fudgy on the inside, crinkly and chewy on the outside brownie. The ingredients are so ordinary and this is so easy that you could make these just about anywhere on the planet. I could even make these out on Ahe where there isn't even a flushing toilet! Seriously, this is one for the road. Now this is a fancy suggestion, and not useful if you're in the Sahara, a remote atoll or the like, but my husband has a wheat allergy so I tried these with gluten free flour (I use Bob's Red Mill All-Purpose GF Flour) and they were even chewier, gooier and delicious than usual. I usually make the brownies without chocolate chips/chunks or nuts because I don't have these available to me but the addition of either or both of these brings the whole brownie experience to another level. Enjoy! Preheat oven to 350 degrees F and grease a 9 inch baking dish. Melt the butter slowly in a medium sized saucepan. When it's melted, remove from heat and stir in sugar. Give it a few stirs and let the sugar dissolve into the cooling butter for a few minutes. Add in the eggs and vanilla (rum or coffee). Beat until smooth. Add the cocoa and flour (I crush all the lumps with a fork and haven't found I needed to sift) and stir for 1-2 minutes, until the batter is smooth and shiny. Stir in chocolate chips/chunks and/or nuts. Pour the batter into the baking dish and bake for about 20-25 minutes, until the top just begins to loose its liquid look. You're much better off undercooking these than overcooking so pay attention and keep checking on them - if you overcook them they'll get cake-like instead of fudgy. I'm going to let you in on a secret. OK it's not a big secret, this place is in all the guidebooks (including mine, the Lonely Planet) and tourist literature, but since no one seems to go it sure feels like a secret. 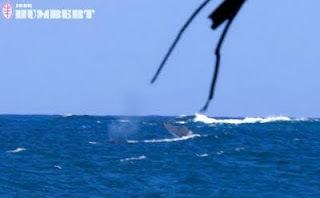 I'm talking about the Fenua Ahiere and Te Pari, the 'lost coast' of Tahiti that is only accessible by boat or on foot. 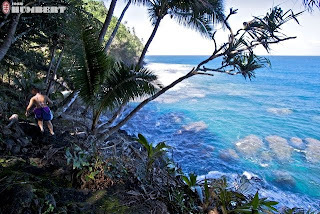 Fenua Aihere means 'the bush country' in Tahitian and Te Pari means 'the cliffs.' The habitated, flat jungle coast of the Fenua Aihere runs southeast from the village of Teahupoo for about 10km till the fringing exterior reef ends and the cliffs , Te Pari, begin. No one lives on this steep coast where the open ocean crashes against sharp volcanic cliffs. Yesterday my family and I took advantage of a perfect, calm sunny day to hike along the wild Te Pari cliffs. 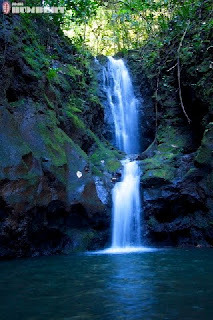 The hillsides are covered in a jungle of pandanus, coconut palms and ferns and are cut every now and then by a waterfall, river, white sand beach or a land-linked coral outcrop. The trail is muddy, skinny and sometimes so steep that ropes have been attached to guide you along, but the effort is worth it. From two different vantage points we spotted humpback whales spouting and thrashing their tails; we bathed in three waterfall pools, ate uto (the spongy interior of a germed coconut), climbed up a lava tube (an elongated shallow cave with a river running through it); and, not so great, got devoured by mosquitoes. This was a beautiful Sunday and we didn't see any other people at all. The reason more people don't go to the Te Pari is that you either need a boat or walk 10km alongthe Fenua Aihere, which takes all day. The numerous river crossings required to hike the Fenua Aihere means most of your gear will get wet plus all the vicious dogs make the walk less pleasant. Even if you have a boat you need to park it and if you don't know the owners of the two docks near the Te Pari entrance, this can be difficult to manage. The best way to visit the area if you're boatless and on vacation is to call Michael at Teahupoo Excursions (http://web.me.com/teahupooexcursion) who leads excellent, fun a la carte day trips to the area. You might also be able to talk Michael into dropping you off and picking you up later if you want to hike alone. The other option is to hire a hiking guide (contact the hiking guide organization at syndicatguides@hotmail.com) and make the two-day overnight trek all the way to Tautira on the other side of the island. I did this a few years ago and it was the best trek I have ever taken in my whole entire life. It's quite demanding and adventurous though (think: swinging on a rope from one rock to another quick enough to avoid getting pounded by incoming surf), so it's not for everyone. The technicality as well as the poorly marked trail, make the two-day trek a dangerous undertaking if you don't have someone who knows the area to show you the way. 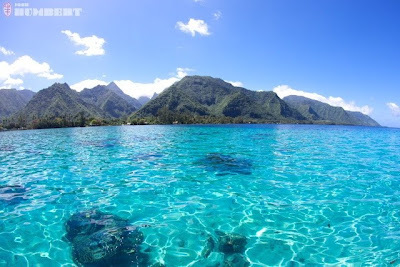 So, I have to say that Te Pari is my favorite spot in all of French Polynesia and I've been to countless islands and atolls in every archipelago. There are so many hidden coves, caves, archaeological remains, waterfalls, beaches and vistas to discover that I think I'll never get tired of it. The area's open-to-the-elements geography means that it's miserable to visit during big swells, rain or high winds - and there's at least one of these elements at large most of the year - so it's a special occasion to find that perfect day and explore. We returned the ship after our tour of Vin de Tahiti's vineyards and wine tasting at the cellar in Avatoru village. 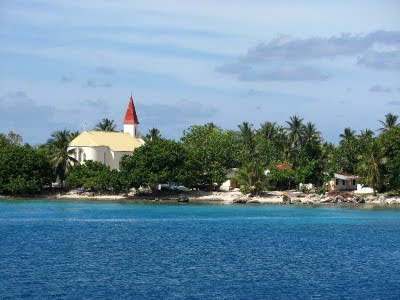 I had assumed we'd be leaving Rangiroa after the Avatoru stop, but not so, first we had to anchor off of Tiputa, the atoll's other village (which is actually the capital although it's much smaller than Avatoru). Because the boat didn't dock, we had to stay on the boat but this was OK since we got to watch the crew perform amazing feats, lowering huge crates, cars, motorbikes and more, down off the boat with the crane and onto a barge which then transported the supplies to the village. The lagoon was calm and the late afternoon sun wasn't too strong so Jasmine and I just found a seat on the deck and watched the show. The job was done by about 5pm, which proved to be perfect timing. 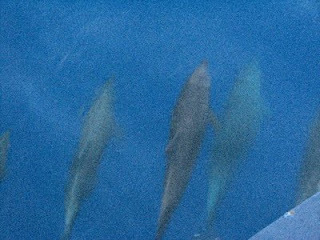 Every afternoon at about this time, pods of dolphins come to play in the Tuputa pass so they all played in our boat's wake as we set out to sea. Jasmine and I sat up at the bow completely captivated by how many dolphins were in the pass and around the boat. With the afternoon light, the salty cool air and the thought that we'd soon be reaching our destination, this was one of our best moments of the trip. 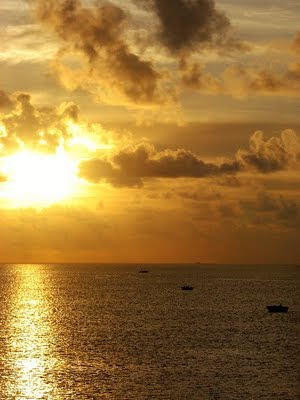 When the sun set and the sea got more rough we went back to our bunks for our last night on the boat. In French Polynesia when gossip is passed along from person to person we call it the coconut radio. This blog aims more for the truth in the form of vignettes, stories, recipes and insights from my experiences living on a tropical island and traveling as a Lonely Planet author. I recently moved to Portland, OR after 15 years in French Polynesia. Even though I'm technically a continent dweller now, I still make it back to the islands regularly as well as to a handfull of other exotic destinations that I cover for Lonely Planet. My travel articles have crossed the seas to appear in newspapers and magazines including Gadling, Islands Magazine and Travelers’ Tales anthologies. For more information about me please go to www.celestebrash.com. Enjoy This Site? Please Donate To Keep It Alive!